A £200m upgrade of Derby station that led to disruption on rail services to and from the East Midlands has been completed. Network Rail said the work was part of the "biggest upgrade of the Midland mainline since it opened in 1870". About 80% of trains had to be replaced with buses for those travelling to and from Derby, after work began in July. A full service between Matlock and Newark, as well as Sheffield and London St Pancras, is due to resume on Monday. 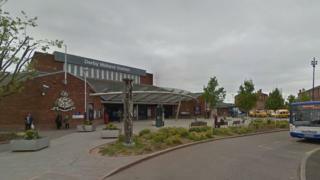 The project began on 22 July and involved 79 days of major engineering work to upgrade the track and signalling system at Derby railway station - the "biggest investment" there for decades, according to East Midlands Trains. The company thanked customers for their "patience and understanding" during the work which it said will provide a "better service" for rail passengers. Network Rail said the work has removed a "key bottleneck" and "improved line speeds" which will reduce delays for the four million passengers who use the station each year. CrossCountry Trains said the work would deliver "faster journeys between Derby and the North East". The investment has seen 17 km (10 miles) of new track, 79 sets of points, 55 new signals, and nine new gantries.